"AND THE BRAVEST OF THESE ARE THE BELGAE"
The little nation of Belgium, with 7,500,000 people, which happened to be in the path of the gray tide, was completely devastated. The German troops claimed that civilians fired on them and as a punishment burned Visé, Tremonde, Dinant, and Louvain whose greatest loss was its magnificent University Library. 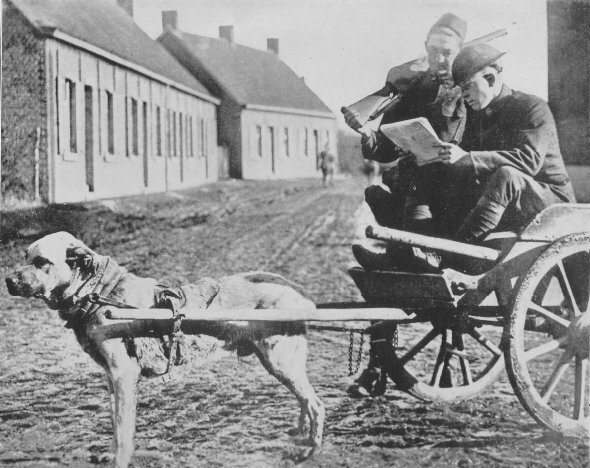 Private John Thompson, 91st Division, and a buddy from the 37th Division, with native dog-cart in Thielt.